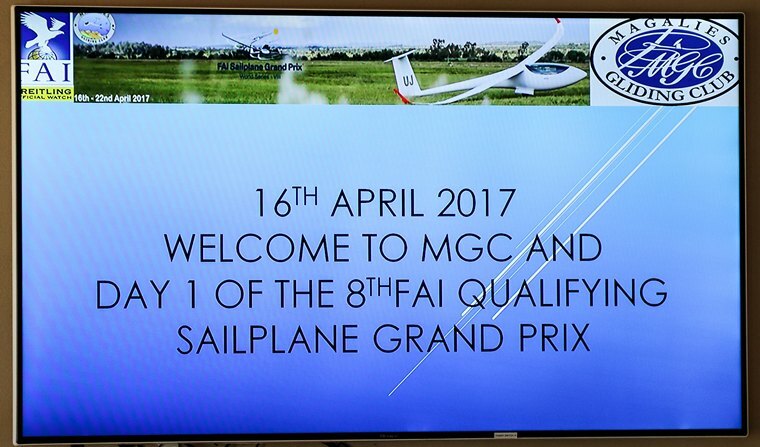 The Federation Aeronautique International (FAI) Sailplane Grand Prix Series VIII for the South Africa SGP 2017 event was held at the Magaliesburg Gliding Club at the Orient Airfield, from the 16th to the 22nd of April 2017. 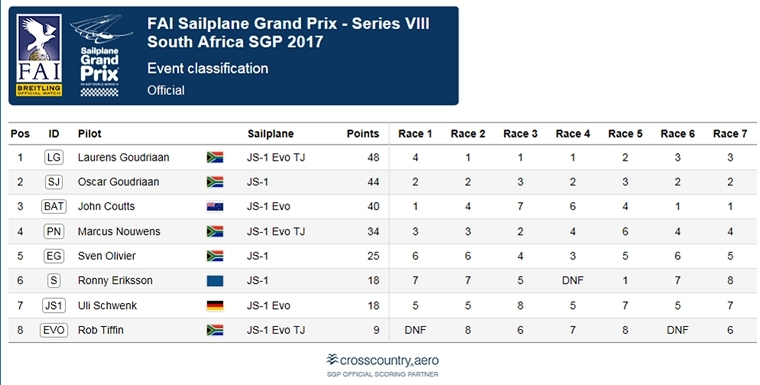 Eight of the world's best sailplane pilots competed for the coveted title of South African SGP 2017 Champion. The winner goes through to the SGP event in Chile in January 2018. The day covered in this article was the first day of the event held on the 16th of April 2017. FAI World Sailplane Grand Prix Championships are gliding competitions promoted by the Fédération Aéronautique Internationale (FAI) that is a concept of racing in sailplanes that is both more spectacular and more easily understood by the public than conventional soaring competitions. ·	A race is typically 2-3 hour in duration and between 200 and 400 km in length. ·	All sailplanes start at the same time (similar to a yacht race or F1 Motor Grand Prix). ·	The sailplanes must cross the short finish line not above a set height of 50 meter and not faster than a set maximum speed. 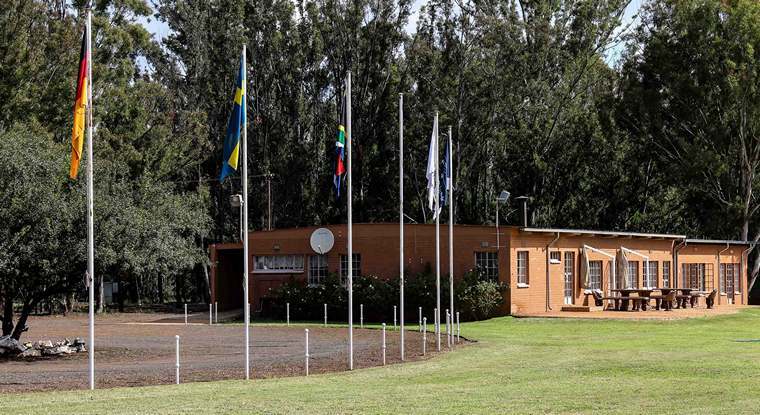 ·	The start / finish line is close to the airfield so that spectators can observe it. ·	Sailplanes race around the course. No team-flying is permitted. The first one home wins as they all started at the same time and there is no handicapping. ·	A place scoring system is used, with 1 point for every finisher you beat, plus the option of a bonus point for coming home first (similar to the F1 Motor Grand Prix). ·	The Competitions is held over seven days and pilots accumulate points each day over the seven (7) contest days. On each of the race days the top seven pilots are awarded points according to their position, the pilot amassing the most points by the end of the contest is the winner. The purpose of a Sailplane Grand Prix is to make the sport of gliding more spectacular for the general public. 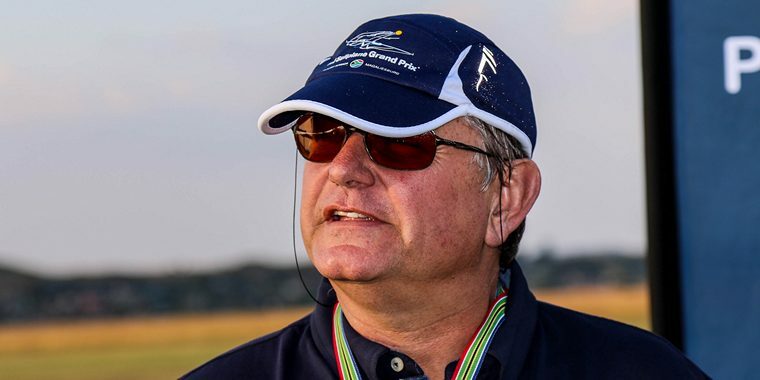 This event is a great way for the South African Public to get to know the sport of soaring. 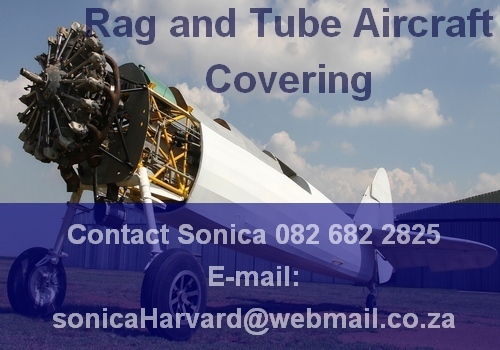 This is especially important because one of the World's top Sailplanes, the JS-1 Revelation that is manufactured in Potchefstroom was used by all 8 sailplane pilots. 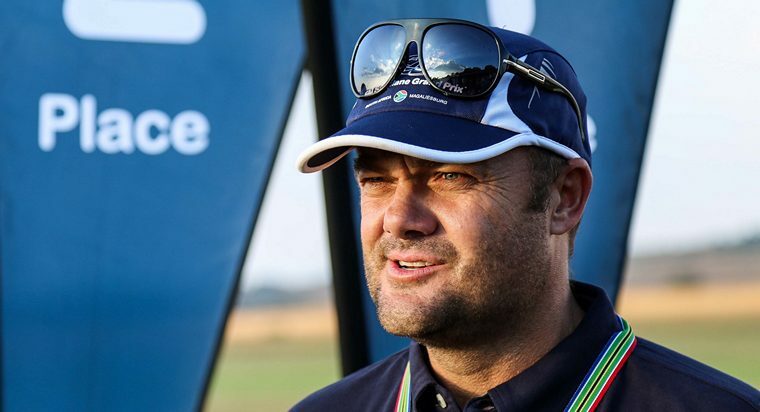 Some of the world's top sailplane racing pilots competed in this race along with South African current National Gliding Champion and previous World Champion, Oscar Goudriaan, who was flying in the JS-1. The competition will be held over a seven day period with all the competitors being given the same task to complete for the day, depending on the weather, tasks were either named A or B. Day 1 Task A - Distance 276.44 km. Start Line at Departure Point 3 towards Turning Point 1 at Coligny backwards to Turning Point 2 at Groot Pan backwards to Turning Point 3 at Orient 5 and finally towards the Orient Airfield. All competitors had maximum altitude limits for the start and finish which was 3048 m (10 000 ft above sea level) and 163 m (50 ft above the airfield) respectively. Time was added if the maximum ground speed of 184km/h was exceeded which was as much as 70 seconds. 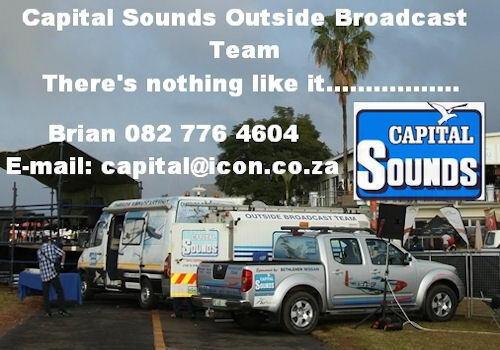 Marcus Nouwens (South Africa) was the 1st to be launched on the Sunday. Oscar Goudriaan (South Africa) crossing the finish line. 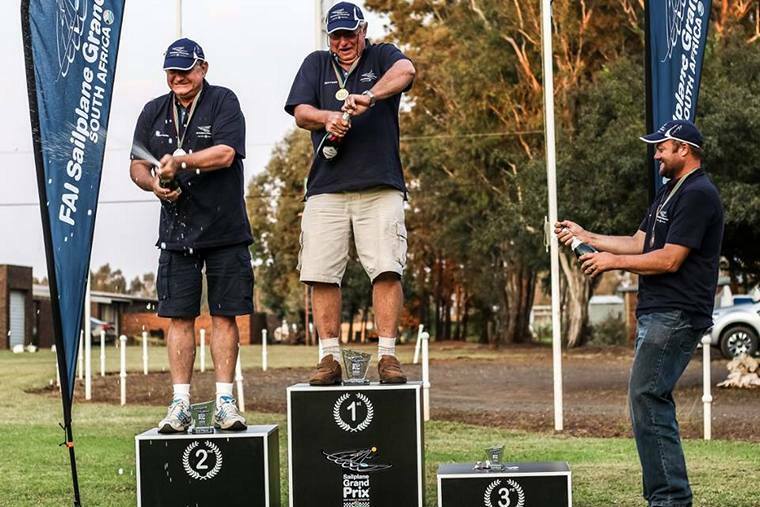 After just more than two hours of flying in favourable partly cloudy weather conditions on the first race day, the competitors came home closely in the first three places and the next three places at about 15 minute intervals apart. The top three finishers all received respective gold, silver and bronze medals for the first race day. John Coutts - 1st Place. Oscar Goudriaan - 2nd Place. Marcus Nouwens - 3rd Place. After five more races during which the podium finish underwent a number of changes the final race was held on Saturday 22 April with Laurens Goudriaan finishing in first, brother Oscar in second and New Zealander John Coutts in third. For more information about the Sailplane Grand Prix, visit the website at www.sgp.aero. Next event is SGP Spain 2017 in Santa Cilia, Spain from the 7th to 14th of May 2017.